Summit Lake Vineyards is the life and love of Bob and Sue Brakesman. In 1971, Bob Brakesman purchased the property for Sue and slipped the deed into her birthday card. When they finally made it to the property on the top of Howell Mountain, it had not been occupied for more than ten years. 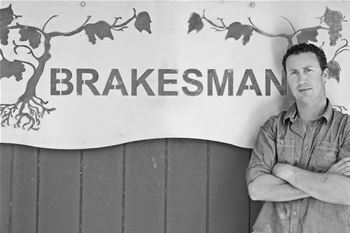 The property is solely run by the Brakesman and Griffin families, with Brian Brakesman serving as the winemaker. The true essence of the Howell Mountain nested appellation is in the altitude and dirt. Deep red clay, volcanic ash dirt and the altitude help produce intensely structured wines that can age for decades. This Howell Mountain single vineyard wine that we have created for you is estate grown, produced and bottled and is a blend of all the grapes that we grow at the vineyard and winery. This one-of-a-kind Premiere Napa Valley wine is aged for 24 months in French oak barrels: 50% new, 25% once used, 25% neutral. Brian was born and raised on Howell Mountain at Summit Lake Vineyards, a boutique family winery famous for its Zinfandel. Working alongside his parents and siblings, Brian developed an appreciation for the art and culture of winemaking, learning every step of the process from vine to bottle. To formalize his education, Brian studied agricultural engineering at Cal Poly in San Luis Obispo. Here, he learned of his exceptional aptitude for identifying the intricate details of wine composition and terrior, and further developed his intuitive grasp of the elements essential to winemaking. After graduation, Brian spent a year traveling the world to broaden and develop his knowledge of wine, stopping for a season of wine and rugby in New Zealand. Wanderlust abated, and palate for worldly wines temporarily satiated, Brian returned home to Napa Valley. He immediately began working with acclaimed consulting winemaker John Gibson, formally of Stags Leap Wine Cellars and Vine Cliff Winery. Here, Brian helped John make wines for celebrated clients including Snowden Vineyards, Andrew Geoffrey, and Salexis. After apprenticing with Gibson for 3 years, Brian became the Assistant Winemaker for Duckhorn Wine Company's Paraduxx Winery. Under famed winemaker Bill Nancarrow’s tutelage, Brian learned to balance the complexities of large-scale winemaking with the high standards and intricacies associated with top-notch, legacy brands. Four years later, Brian was hungry to run the show and accepted the Winemaker position at Ledson Winery in Sonoma. Employing the skills and unique enological insights developed over his lifetime, Brian made over 82 wines per vintage from a catalog of diverse growing regions over his 4-year tenure at Ledson, and significantly elevated the quality of wines and brand. Today Brian is the Winemaker at Summit Lake Vineyards & Winery, Consulting Winemaker, Owner at burgeoning Red Thread Wine Company, and lives with his wife and children just around the corner from his family winery on Howell Mountain.